For nearly two centuries harem pants remained mainly in the Middle East and I Dream of Jeanie episodes. Even today many people would not know what you are referring to if you mention “harem pants”, however they might know what “hammer pants” or “happy pants” are. Seldom seen in the last twenty years, harem pants (unlike MC Hammer), have made a spectacular comeback. While it is easy to overdo the sharp contrast of baggy thigh and skinny jean calf, a properly executed harem pant can add comfort and style to any wardrobe. The key is finding the right harem pant pattern. Harem pant patterns tend to be a medium to challenging design to pull off as the gathering needed to achieve the look can be tough. The less pouf to the pants the easier the pattern will be to execute, the more pouf the harder the pattern. When looking for a Harem pant pattern take into consideration your body type, while it may be appealing to hide a thicker body under baggy pants, don’t. It will only emphasize the areas you are trying to cover. Instead opt for a gentle gather in a flowing, not clingy or stretchy, fabric to smooth over any flaws you may want to hide. When choosing a fabric for your pants, be sure to find something that flows nicely. Stiff fabrics will make for stiff folds and can prove quite heavy depending on how much material and gathering goes into your harem pants. Many stretch fabrics are not advisable as it tends to cling to the body instead of falling in soft folds. 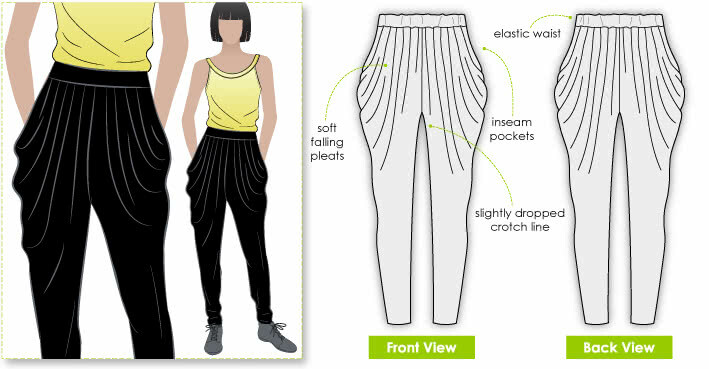 If you want to make a pair of harem pants with some stretch to them then stick with natural fibers, t-shirt cotton or cotton jersey knit will fall better and cling less than synthetic options. An updated style of harem pant pattern in our range is the Ruby Jumpsuit, which incorporates harem pant features in a jump suit design. 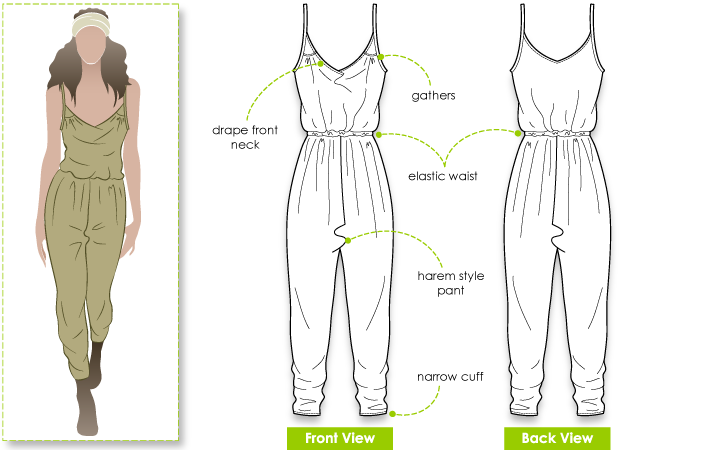 It has a medium gather and the jumpsuit design takes the hassle out of finding a shirt to go with your pants. If you follow the suggested fabric description you will have a piece that drapes smoothly for a shabby chic, boho style. Don’t forget to embellish your new harem pants! Pockets are optional, though there is so much room that it would be a shame to not have them. Understated bows, studding and a little lace can do a lot to liven up any pair of pants.